Silambarasan is a very happy man these days with his recently released Vinnaithaandi Varuvaayaa getting him appreciation from all quarters. Work on his next venture Valiban is also underway and meanwhile he has extended a helping hand to his friend Jayam Ravi. Industry circles know that Silambarasan is good in singing and has rendered quite a few numbers in his films as well as in other films. Recently the track that he crooned in Renigunta came in for a lot of praise. It is his principle to sing for any friendly requests and following this he has sung a number for the upcoming Jayam Ravi- Tamannah starrer Thillalangadi. 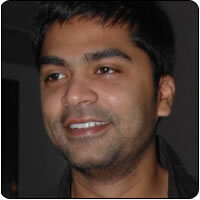 It is a known fact that he and Jayam Ravi share a special rapport and the singing only reiterates this fact further. WHAT TAMANNAH THINKS OF RANJITHA? Ajith goes back to car racing! What happens when Vijay is irked?